Cutaneous Cryosurgery is an invaluable practical guide for the management of benign, premalignant, and malignant skin lesions. 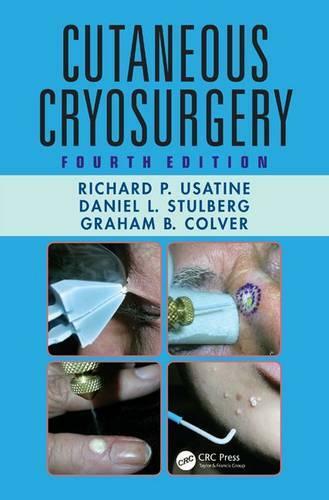 The book provides practitioners with all the information needed to add cryosurgery to their surgical repertoire. For practitioners already using cryosurgery, many pearls are provided to expand the use of cryosurgery for new indications along with helpful tips for the use of cutting-edge cryosurgical equipment. This new edition of an established reference uses an evidence-based approach, including a chapter reviewing the evidence for using cryosurgery to treat viral warts, actinic keratosis, and basal cell carcinoma. It also discusses patient consent, aftercare, side effects, and complications. In addition, the book reviews other low-temperature systems used for therapeutic tissue destruction. With nearly 300 clinical color photographs, the book is an outstanding resource for dermatologists, family physicians, other primary care physicians, nurse practitioners, physician assistants, podiatrists, plastic surgeons, head and neck surgeons, and oculoplastic surgeons alike.